I don’t know where to start with this film, it’s funny but with a kind of heart felt performance. It’s the best character I have seen Seann William Scott perform. It is funny but also crude and coupled with brutal violence, this doesn’t bother me so I liked it. Super strange film to review. 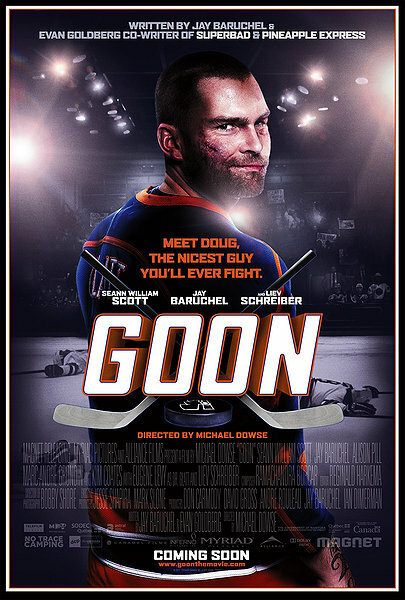 Not content with his job as a bouncer at a local Beantown bar and a bit of an embarrassment to his accomplished family, Doug Glatt (Seann William Scott) dreams of the kind of success enjoyed by minor league hockey goon Ross Rhea (Liev Schreiber). When a chance encounter with an on-ice thug leads to a bloody fist fight that Doug easily wins, the coach of the Halifax Highlanders sees potential in this mammoth sized man who is only hampered by his lack of any hockey playing ability and his brother’s old figure skates. Standing up to the taunts of the other players, Doug manages to join the team, and with the encouragement of his hockey obsessed best friend (Jay Baruchel) quickly becomes a rising star. Soon he’ll have the opportunity to face off against Ross “The Boss” Rhea and perhaps finally land a girlfriend. Now – all he needs is to learn how to skate. The advice I would give to readers is expect it to be just stupid or even clever it’s something of both with real heart in its characters. Tim’s Film Reviews: It’s a good watch, so rent it. To start off let’s talk about the acting. The acting was actually pretty good considering it’s a comedy about an idiot played by Seann William Scott in which he becomes a hockey player whos sole job is to beat people up, still don’t know how I ended up liking it because I don’t even know anything about hockey. The main characters where at times very funny and make for great watching. The rest of the cast do a great job with a great villain role going to Liev Schreiber being as bad as always with his role as opposing beater upper. In terms of humour the best parts where in the locker room talks and scenes on Pat’s show with all it’s bad language and crude body language that just kind of feels right for that type of would. Now I can’t believe I am saying but in terms of acting and why I really liked this film I would have to say it’s the heartfelt performance of Seann William Scott as Doug Glatt, which from the love story to his fights on the ice to talks with his team mates you start to feel for the character which is still baffling me as I write this. The best review I found would be either “The best thing about “Goon” is not the hockey action, or who wins and who loses. It’s Doug’s rags-to-riches story.” Roger Ebert. This review works well for me mainly because it’s what I think I like about the story, not so much the comedy or even the hockey but Doug’s journey to the top which only really works because you feel for him. My favourite scene would be the final conflict between Doug and Reardon because you begin to feel tense and a little worried about Doug, which you will see when you watch it. Nice write up. I really liked this film, always good to see Scott get a leading role.